I love to paint people, especially their faces. I’ve always enjoyed observing how people are put together and the things you can tell about a person from studying their features. Whether they laugh a lot, or if they smoke, or if they worry. It’s all there, written in their beautiful faces. 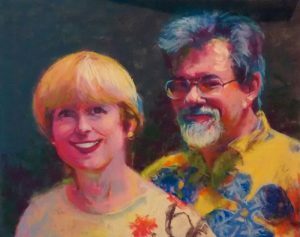 Jim and Barb, 14×11″ pastel on paper, sold. These are some of the portraits that I’ve done on commission. I’m always happy to help someone commemorate a life or celebrate a birthday or anniversary. Please contact me if you’re interested in a commissioned portrait of a loved one.